MacPro Quad OSX 10.7.5, 16G Ram, 2TB HD, Digidesign 003 Rack and *********/Midas interfaces. Same thing for Midas, contact them or look on their website for the appropriate Mac OS X drivers. 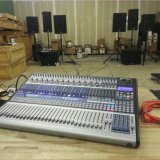 if I upgrade from Studio one 2 to 3 , will my old projects open with Studio one 3 ? If I buy the Audiobox iTwo now, will I get Artist 2 or Artist 3 in the bundle? Will it be okay to attach StudioLive 32.4.2 to my existing Studio One Producer?